What do economists know that business executives find useful? Economics ought to be indispensable for business decision-makers because it deals with the issues executives face daily: what to pro duce, how and how much, at what price, how best to use resources (time, labor, capital), how to understand markets. Why, then, do managers often think that economists' theories are ivory-tower and impractical? Perhaps because most economics texts are mystifying, jargon-rid den, and written from every perspective except that of the line manager. 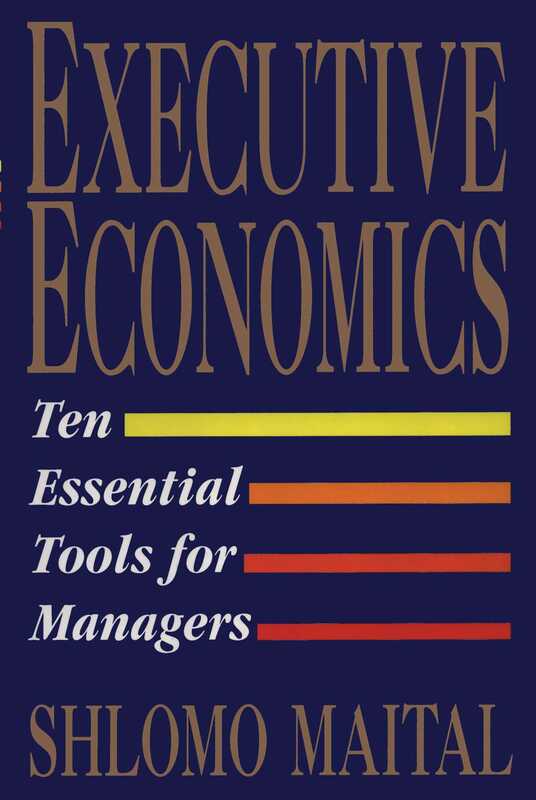 In Executive Economics: Ten Essential Tools for Managers, Shlomo Maital brings economics down to earth, back to the hard day-to-day decisions that executives have to make. He shows how all decisions can be organized around two key questions: What is it worth? What must I give up to get it? Answering these questions depends upon finding and maintaining the right relation in the "triangle of profit" -- cost, price, and value. Each of Executive Economics ten chapters focuses on one or more legs of the triangle of profit, defines a decision tool, and illustrates how it can be used to improve the quality of executive decisions. Drawing on recent examples from both Fortune 500 firms and smaller companies, Maital shows why economics main contribution is to deepen executives' understanding of the structure of their costs, and to explain why some of a business's highest expenses are those that never appear on a check stub or in a profit-and-loss statement. Executive Economics is written for executives, about executives, and by an author who has both taught executives at MIT's Sloan School of Management for over a decade and served as a consultant to small and large businesses. It is must reading for executives who need simple, effective decision-making tools to give them an edge in today's competitive global economy. In 1984 I was asked to teach economics to a group of seasoned managers with scientific and engineering backgrounds in the MIT Sloan School of Management's Management of Technology M.Sc. program. In one class, a young woman -- a senior manager at IBM -- asked me politely but firmly, "why do I have to know this?" My response was pitifully lame -- something like, "well, because...because it's economics, and this is an economics course." For me, that question was an epiphany. I encounter it often when facing her equally challenging successors. Generally, I try to ask it before they do. Most master's programs in management require candidates to take at least one course in economics. It is considered self-evident that managers, whose job it is to hire labor, borrow capital, acquire technology, and buy materials to make goods and services, need to know microeconomics, the discipline that studies precisely that. But while obvious to their mentors, the relevance of economics in its current form is often not so obvious to the managers or would-be managers themselves. It is not obvious to working managers that the subject matter of conventional economics is either relevant or useful. This is true, despite the fact that among the CEOs of America's largest 1,000 companies, economics was their second most popular major in college (after engineering). Most of my manager-students had over a decade of practical experience in business. They challenged me repeatedly to demonstrate the utility, relevance, viability, and applicability of the theories I taught them. For far longer than I would have wished, I drew a blank in proving to them the added value of economic concepts as tools in business decisions. It took me a decade of on-the-job training, teaching economics as a management tool to managers in the United States, Europe, and Israel, and recently serving as a consultant, for my manager-students and clients to educate me sufficiently so that I could write this book. To be honest -- another decade would not have hurt. After about five years of teaching managers, I wondered whether anything that I taught them had proved useful, after they left the classroom and returned to their companies and jobs. I wrote to 150 former Management of Technology students and asked them to rate on a scale of one to six each of the 30 economic concepts I had taught them, in terms of how useful it had proved in their day-to-day decisions. I learned from their responses that the parts of micro-economics they used most were those that helped them understand costs -- including "hidden" or opportunity costs (see chapter 2), marginal costs, sunk costs, and learning curves -- and the links between the costs of production, the value of their products, and the prices they get for them. Later generations of managers have confirmed this finding. It is reflected in the fact that the first seven chapters of this book deal in one way or another with costs -- in contrast with most microeconomics texts, which usually race to discuss demand after a polite introduction, even though demand, I believe, is a subject where economics has relatively little to communicate to managers. My results echoed those from a broader survey of how managers use economics, undertaken in 1982 by Guisseppi A. Forgionne. He canvassed a random sample of 500 corporate executives drawn from the 1,500 largest American corporations. Forgionne found that fully 70 per cent of the executives said they make use of most of the basic economic concepts of cost (such as economies of scale, cost functions, and learning curves, all of which will be discussed in later chapters), price (supply and demand, marginal-cost pricing) and value. Some 86 percent of the respondents said the major benefit in implementing economic concepts in decision making is that "the analysis generates useful data, and...forces the decision maker to define the problem clearly and concisely." Yet, more than half cited "poor communication" between economic specialist and manager, and nearly 60 per cent complained that "inadequate data are a barrier to implementation [of economic tools]." This, despite the fact that most managers literally drown in data, spewed out endlessly by costly, sophisticated management information systems. Clearly, the Exec need a travel guide to the curious land of the Econ, and a basic dictionary. And in a sense, this book is that travel diary, an account of what I learned in my decade-long journey among the Execs. My hike along the path of applying economics to business decisions began with the deep conviction that somehow, economics was a powerful tool for managers. It was the insightful comments and criticisms of hundreds of experienced managers delivered in classrooms through over a decade that strengthened that conviction and led me to write this book. The thinker and essayist Ralph Waldo Emerson was known to despise small talk. He liked to greet friends and visitors with the question: What have you learned since we last met? This book is a response to Emerson's question: What have I learned since that day in class before a group of independent-minded managers who refused to swallow theory for the sake of theory alone? It is built on the belief that economics, a venerable discipline with well over two centuries' worth of serious intellectual capital, is a product or service of great potential value to managers -- provided that knowledge can be conveyed in a language and framework that is understandable and relevant to their experience and needs. It is stimulated by the incredible, rapid changes sweeping over the world, as nations once guided by blind adherence to central planning and Marxist doctrine switch to business-driven, free-enterprise market systems and bureaucrats yield power to entrepreneurs. During the past three decades, management became "disciplinebased." Managers sought expertise in one particular area -- accounting, law, marketing, finance, production -- and rose to top jobs as their companies perceived that particular expertise crucial. Four of every 10 top executives rose to the top of their companies either through finance and accounting, or marketing -- roughly equally divided between the two disciplines. To some degree, this trend continues. High-technology companies like IBM and Westinghouse have recently wooed and appointed to top posts managers with backgrounds and skill in marketing (from, for instance, RJR Nabisco, a food company, and Pepsi-Cola). They did this because they believe that this particular skill is of crucial importance for the health of their business. Take General Electric, one of America's most consistently profitable and well-managed companies, fifth-largest industrial company in the U.S., with a market value of $90 billion as of March 1994. GE has shown the ability to make money from such diverse businesses as jet engines, financial services, and a TV network (NBC) on a global basis. Part of that success is due to their cadre of good general managers, assiduously trained and cultivated, able to move between GE's widely differing businesses because of strong management competencies that cut across many different disciplines. The new breed of general manager is far different from the ones that ran the old-style patchwork firms. The new-style manager is comfortable with diversity. He or she is able to assemble a well-defined company culture out of seemingly incompatible pieces. No longer is the CEO the only person expected to understand the company as a whole. No longer do functional vice-presidents meet and communicate only when the CEO calls them together. Increasingly, middle managers, too, need to have a broad view of their company, even if their responsibilities lie mainly in finance or marketing, or a single business or product area. Decisions are now often made by teams and team members, who need to know far more about each other's problems and expertise than in the past, because they cut across narrow functional partitions and product lines. New corporate structures are forming with "fuzzy boundaries" that create many horizontal links among departments and divisions. Such links are facilitated by new technology like computer networks and information technology that enable managers to easily communicate with colleagues, subordinates, and suppliers across long distances. Once, top management found it costly and time-consuming to acquire information about a company's operations. Today, an unending stream of information is available at the touch of a modem button. General managers need to know how to tap that stream and how to sip from it judiciously. The rise of the general manager poses new challenges for American companies. Companies with cadres of managers who read blueprints as easily as they decipher balance sheets, who can cooperate with competitors in R&D as fiercely as they compete with them in markets, and who know a lot of things about a lot of businesses, will win an enduring advantage over their rivals in the struggle to create new wealth and profits from new and existing assets. In this new and different business world, competency counts, not credentials. As a result, it will no longer be sufficient for managers to employ economists. To some degree, they will have to become economists. That will require a fundamental understanding of the language and logic that underlies the economic approach to decisions. To manage is to choose. Economic logic, employed properly, can be a tool of great parsimony and power for the new general manager, as he or she makes hard choices across a broad spectrum of business issues including technology, human resources, markets, production, finance, marketing, and social and ethical responsibilities. The job of managers is to build and run businesses by selling goods and services that provide value at a reasonable price for their customers at an acceptable cost to the business. If managers create more value at lower cost than their competitors their businesses prosper and profit. This is the nub. Everything else is embroidery. The health and wealth of a large number of individual businesses -- small, medium and large -- determine the economic health and wealth of a nation. When they succeed, managers create wealth, income, and jobs for large numbers of people. When they fail, working people and their families suffer. It is businesses that create wealth, not countries or governments. It is individual businesses that are either competitive in world markets or are unable to sell in them. It is businesses that decide how well or how poorly off we are. And in the end, it is the consistent quality of managers' decisions, along with how well they are implemented by the people who work for them, that decide how competitive businesses are and will become. Business decisions are built on three pillars -- cost, value, and price (see figure 1.1). Cost is what businesses pay out to their workers and suppliers in order to make and market goods and services. Value is the degree to which buyers think those goods and services make them better off, than if they did without. And price is what buyers pay. Those are the three essential elements in the day-to-day choices managers make. Juggling those three elements is what managers are paid for. Managers who know what their products cost and what they are worth to customers -- and who also know the costs, values, and prices of competing products -- will build good businesses, because their decisions will rest on sound foundations. Businesses run by managers who have only fuzzy knowledge of one of those three pillars will eventually stumble. It is deceptively difficult to build them, precisely because they have to be built -- the information required is often incomplete or not readily at hand. Knowledge of the three pillars is necessary, but not sufficient, for smart decisions. Success also requires wisdom, experience, good humor, humility and courage, and luck. But other things equal, managers who truly understand costs, values, and prices and how they interact will do much better in the long run than those who do not. This book provides a series of economic tools to help decision makers stay focused on building accurate perceptions of their companies' costs, prices, and values, and the links among them. Regrettably, there is a large gap between what managers know about economic decision tools and what they need to know, one that needs to be closed. The eminent British scientist Lord Kelvin once said that "theory begins with measurement." His precise measurements formed the basis for what came to be known as Kelvin's Law. Many scientists would disagree with Kelvin. They would argue that theory begins with...theory. Few people would dispute, however, that management begins with measurement. What you cannot measure, you cannot effectively understand, control, or alter. Without an adequate understanding of the ten economic tools explained in this book, decision makers are more likely to miss, for example, important but hidden costs that should be taken into account, or regard as important sunk costs that deserve to be completely ignored. A major benefit of cost-price-value economics is that it forces decision makers to scrape together -- or have someone do it for them -- the basic data on performance without which good decisions cannot be made. Are managers really worth their pay? If cost-value logic is useful, then it should be be possible to use it to measure the value of managers, compared to their cost. This is an especially controversial topic these days, as the flagging performance of many American businesses contrasts sharply with the allegedly excessive salaries that their managers draw. According to a recent survey, American chief executives of companies with annual sales above $250 million earned five times more than their counterparts in Korea, and double or triple that in Austria, Germany, Canada, Argentina, Sweden, and Japan. Here is how cost-value economics can be used to determine whether or not a company's executives and managers are in fact earning their way, developed by business expert Paul Strassman. Strassman's method shows that contrary to common belief, not all Japanese managers are the corporate equivalents of Babe Ruth. Even the legendary Sony Corp., regarded by many as one of the world's best-managed firms, with a long list of products that it innovated, may have much inefficiency among its top brass and line managers. Strassman measures the value or contribution to the company by managers by what he terms "management value added" -- literally, what managers themselves add to the firm's value. Value added is a very important idea in economics that is frequently encountered. It means exactly what it says: how much value, for example, does the carpenter add to the wood he buys, when he turns it into a table? It is the difference between the cost of the wood to the carpenter and the value of the table when he sells it. For knowledge-based products, value added tends to be very high; the cost of the silicon and glue that comprise microprocessors is miniscule, compared to its value, and the cost of the eight or ten diskettes on which a software application is written is negligible compared to the price and value of that software. Management value added is what managers add to the firm's value. It is the difference between what they cost the company (like the carpenter's wood), and what they bring in to the company (i.e., the value of the table). Management value added is the part of overall business value added that is not attributable to a business's worker or shareholder capital. To calculate management value added, we must first compute total "business value added." This is equal to the firm's total revenues (what it earns from selling its products and services), minus all taxes and purchases (the cost of raw and finished materials, parts, energy and services, including interest payments). This is directly comparable to the difference between the value of the carpenter's table, when sold, less the value of the wood used to make it. In 1989, Sony had sales of $9.5 billion. It bought materials (and paid taxes) of $8.5 billion. That means that it added $1 billion of value to the inputs it acquired -- its business value added was $1 billion. (See table 1.1). Not all business value added is created by managers. Much of it comes from the capital provided by shareholders. Hence, to isolate management value added, we need to deduct from business value added the value that the shareholders' capital has provided: "Shareholder value added." Shareholder value added is equal to the total value of shareholder capital -- known as "shareholder equity," an important concept discussed in a later chapter -- multiplied by the going interest-rate cost of that capital (say, 8-9 percent). Shareholder equity is simply the value of Sony to those who own its stock and is equal to the difference between what Sony owes (its liabilities, or debts), and what it owns (its assets). In principle, this is what Sony shareholders would be left with if Sony sold all its assets and used the money to pay off any outstanding debts. Shareholder value added is the interest that shareholders could earn on their money in an alternate investment that has equal risk. (The notion of hidden, or opportunity, cost is crucial in management decisions; it will be discussed at length in the next chapter.) For Sony, shareholder value added amounted to $0.5 billion -- say, $5 billion in shareholders' capital, with each dollar of that capital earning about 10 percent a year, giving $5 billion x 10 percent = $0.5 billion. Deduct this sum from business value added. Sony's operations costs in 1989 amounted to $300 million. Its management costs were even greater: $400 million. (This may be somewhat misleading -- Sony purchases a lot of its components from suppliers, so a large part of its costs appear not as wages but as purchases.) Deduct operations and management costs, and what remains is "management value added." Using the cost-value decision framework: What do managers cost? What are managers worth? it is seen that for 1989, Sony's managers cost more than they contributed in added value. This does not mean that two-thirds of Sony's managers should be instantly fired. But it does mean that Sony needs to examine closely whether its spending on all levels of management might not be excessive. Paul Strassman suggests looking carefully at the ratio of "management value-added" to "management costs," what he calls "Return on Management. "™ This is similar to the "Return on Investment" concept, where investors take the profit they make from their investments and express it as a percentage of the cost or value of that investment itself. "The high-purchase, capital-intensive and low Value-added Sony shows a negative value of R-O-M [return on management] which suggests that this firm has a productivity problem," Strassman concludes. Strassman studied over 300 firms. Of these, more than a fifth showed negative management value added. Those firms clearly need less management (or better), not more. Executives of firms that do not use the value-cost decision framework on themselves and their managers may not be aware of this. Their company will do more poorly than it could or should. The average return on management for manufacturing firms is, he observed, 50 percent. If your company is making less than that consistently, over a period of years, you need to re-examine the quantity and quality of your management work force. He provides a comparison of the return on management for the leading Japanese consumer electronics firms. They differ widely. For Toshiba, for each dollar spent on management, about two-thirds of a dollar was added in value, over and above that dollar itself. This is the highest return on management of all the companies, and far above the rate of return that most companies or individuals earn on their capital investments, for instance. An expert on information systems and computers, Strassman uses his "return on management" concept to examine whether and when firms should invest in more computing power -- a good example of cost-value logic. His prescription, based on long experience and data: You get better value out of the high cost of investing in computers, when you first try to get better value out of your existing managers by trimming excess numbers of them. Since new computer systems often need more managers, if you fail to do this, you may end up with both unneeded computers and unnecessary managers -- and will likely be unable to tell this is so, because the managers will look exceedingly busy and efficient with their new hardware. Computers are terrific at helping us do many tasks that may not need doing at all. Don't do fast and well, Strassman warns, what need not be done at all. This is confirmed in Peter Drucker's account of a conversation with an information manager at a large financial institution that invested $1.5 billion in information technology. Despite the massive spending, no one in his department had yet thought seriously about what information was needed -- and what was not -- in order to serve their customers. The issue of what information is needed, or not needed, needed resolution well before the $1.5 billion in information technology was spent, not long after. The American humorist and writer James Thurber once said, in a serious moment, that it is more important to know some of the questions than all of the answers. This is especially true in running businesses. Successful businesses pose no questions, because they are successful -- yet to remain so, those who run them have to question themselves and their actions daily. And it is not easy to raise questions, and get organizations to deal with them in earnest, when no evident problem is in sight. Yet, there may be no sillier slogan in management than "if it ain't broke -- don't fix it." If it "ain't broke," it probably soon will be, given the rapid pace of change in global markets and technology. And it is much tougher to cure the problems of a business while it tumbles downhill than to patch up one that is still at the summit, though starting to teeter. Take, for instance, IBM. In 1972 and again in 1982, IBM was the world's largest company, measured by the market value of its stock. Indeed, in 1972, IBM shares alone were worth $46.9 billion, close to the value of the shares of its two closest rivals taken together, AT&T ($29.2 billion) and Eastman Kodak ($23.9 billion). At its peak in 1987, IBM stock sold for $176. By 1992, IBM was not even among the top 20 most valuable firms. In 1993 its shares sold for a quarter of their peak value. Much of IBM's rapid descent occurred in a relatively brief period, since 1989-90. What happened? The answer lies in the cost-value-price triangle. Costs: Like many big, profitable companies, IBM's problems grew out of its success. Its profitable System/360 mainframe computers gave IBM market leadership. But it also created a huge bureaucratic organization, one that led IBM's payroll to double in only three years (1963-66), and ultimately peak at 407,000 in 1986, and made its decision-making process cumbersome and sluggish (in some cases, over a dozen executives needed to "sign" a decision in order to implement it). When IBM's new CEO, Lou Gerstner, took over in early 1993, he found that IBM was spending 42 percent of its sales on costs (including Research and Development costs), compared with less than a third by its rivals. True, personnel costs were slashed sharply, by $3 billion, as IBM quickly shed 120,000 workers. But other expenses (such as the writing-off of products in inventory that no longer could be sold, or could be sold only at lower prices) rose by $7 billion. IBM's costs of processing data amounted to one dollar out of every 14 sales dollars -- three-and-a-half times the proportion of other American firms, on average. Perhaps worse than the excessive costs themselves was the fact that it was hard to pin down why they were so high. In 1990, in an effort to fix what was clearly broke already, IBM decentralized into 13 operating units. This major organizational change apparently was not accompanied by a change in the way IBM collected and analyzed its cost data. As a result, efforts to cut costs were hampered by difficulty in pinning down where unnecessary expenses were being made. Value: IBM once commanded premium prices for its products, as the market recognized IBM products' market leadership and superior performance and quality. But while striving to preserve its lead in mainframe computers, IBM was caught from behind by ever-more-powerful personal computers, minicomputers, and work stations. It failed to exploit a technology that made smaller computers much more competitive with their larger cousins dominated by IBM, a technology IBM itself invented (known as RISC, reduced instruction-set computing) but failed to see its huge potential. It failed to take advantage of its own highly successful PC (launched in 1981) and let competitors and imitators grab the market, partly because its PC had no strong constituency within IBM itself, especially in its sales force. And it clung to its "no layoff" employment policy, long after that policy was no longer viable. Price: As the market's perceived value of IBM products declined, so did its relative prices. The result of eroding prices and rising costs was that IBM's gross profit margin -- once much higher than its rivals, at 55 percent -- dropped to the industry average, around 40 percent. IBM wrote off $28 billion of its capital in the process of restructuring. The profit circle, at the center of the cost-price-value triangle, was badly squeezed. In 1992, IBM declared a loss of nearly $5 billion, a bit less that than of Ford Motor Co. ($7.4 billion loss) and a lot less than General Motors ($23.5 billion loss). Indeed, there are similarities between IBM, GM, and Ford. All three scorned the early competition from small, cheap versions of their products -- PCs and compact cars -- and missed the threat those products implied, in the value they provided relative to their cost. In the spring of 1973, Pete Estes, a top General Motors executive, asked a car expert named David E. Davis to "go to Europe and take a look at the new front-wheel-drive cars that were just coming out there," like the Volkswagen Rabbit, that were "generating excitement as no small cars had done in years" among both customers and engineers. In a few weeks, he reported back to Estes. They were better cars, he said, better engineered and better built than those Detroit was making. Front-wheel drive was a breakthrough of immense significance. It was the state of the art. But Estes just shook his head. In the end, GM, Ford and Chrysler were all stuck with rear-wheel drive. None wanted to take the lead and pioneer in (for them) a new, costly and untried technology. Davis told Estes he was making a major mistake, and that eventually the customers would let him know. In a few months, when the OPEC oil embargo struck, the American auto industry was completely unready, and its products were suddenly very wrong for the marketplace. Pete Estes weighed cost, price, and value. The source of customer value of front-wheel drive was its elimination of the bulky drive shaft that transferred power from the engine to the rear wheels. Instead, power was sent directly to the front wheels, giving the car better traction and handling qualities, less weight and better gas mileage, and flattening the annoying camel-hump in the back seat. The added cost of front-wheel drive was then estimated at a minimum of $95 per vehicle. Could front-wheel drive justify the high cost (and risk) of building plants and buying equipment to produce it? Whole new engines and drive trains would have to be built. Cars would have to be totally redesigned. Existing plants and equipment would become obsolete. Was it worth it? Could the massive investment be justified to General Motors' shareholders? And would buyers pay enough extra for front-wheel drive -- was it worth enough extra to them -- to let GM at least recover the $95? Estes' decision was: No. The value (and higher price) of front-wheel drive could not justify its added cost. It is easy to fault Estes' decision from today's vantage point, knowing as we do how the price of oil and gasoline soared, making the fuel-efficiency advantage of front-wheel drive more valuable to car owners. But with crude oil then at $3 a barrel, and gasoline at 25¢ a gallon, with no hint that its price would soar, a decision to invest billions in a new, mainly fuel-saving, technology might have then been perceived not as courageous but as foolhardy. Whatever the case, it was a decision that ultimately would cost GM dearly, as costs, price, and value combined to squeeze once-high profits into huge losses. Like IBM, General Motors was once one of the world's biggest firms, ranking fourth in the market value of its stock in 1972 and fifth in 1982 -- but like IBM, dropping out of sight in 1992. One small but notable element in GM's woes was a major cost that for years was kept invisible. Labor contracts call for GM (and the other major car firms) to pay for the health benefits of its thousands of retired workers. Since those costs were to be incurred far in the future -- and could only be guessed at -- for years, accounting rules permitted them to be ignored. The result was billions of dollars in expenses that were not acknowledged in financial reports. Those costly chickens did ultimately came home to roost, as top managers at GM knew they would. Each of the three arms of the profit triangle -- cost, value, price -- is important to decision makers. But if pushed to the wall, managers might agree that the "value" arm is perhaps more weighty than the other two. How your business creates value probably takes precedence over how it incurs costs, because cost-cutting is pointless if the good or service that results is not valued by the market. Determining on an ongoing basis how well your business is creating value, and how you can innovate to create value in new and important ways, compared to your competitors, is a key question every business decision maker has to address. It is the decision area in which top managers have the greatest impact. Here are two examples: Diet Coke and the Sony Walkman. In 1980, Roberto Goizueta was chosen to become Coca-Cola's CEO. In 1982, he decided to invest a large sum of capital in order to introduce Diet Coke, a product his predecessor had utterly banned. Many of his advisors told Goizueta this was folly, including his lawyers, who said he was endangering Coke's all-important copyright on its brand name. Goizueta insisted, and persisted. He felt the value in the product -- the taste of Coke without its heavy content of sugar and calories -- would generate large sales, at reasonable prices, that, matched against the costs, would create profit. He was right. Diet Coke has been called "probably the most successful consumer product launch of the Eighties" and is now the world's third most popular beverage, after Classic Coke and Pepsi. Partly spurred by Diet Coke, the market value of Coca-Cola stock soared from about $4 billion in 1980, when Goizueta became CEO, to $54.0 billion on March 4, 1994. Coca-Cola now has market share close to half of the global beverage market. Its Diet Coke product also has numerous imitators -- the inevitable fate of a new product that creates value by innovating. Peter Drucker once wrote that "if you see a successful business, then you know someone once made a courageous decision." Coca-Cola is today a highly successful business. Its annual 1993 sales of $14.0 billion grew by over 12 percent. It has net profit of $2.2 billion. Its stock price, as of June 30, 1993, was two-and-a-half times its level at the end of 1989. Coca-Cola has been labelled "the world's best brand" by Fortune magazine. Warren Buffett -- one of America's wisest and most successful corporate investors and head of Berkshire Hathaway, which owns 7 percent of Coke stock -- explained why. "It sells for an extremely moderate price. It's universally liked," Buffett said. And, he might have added -- it doesn't cost a lot to make and distribute. Price, value, and cost became three pillars of profit for Coke. Sony's Walkman is another example of a courageous cost-value-price decision, made in the face of experts' warning of disaster. The founder of Sony, Akio Morita, was instrumental in developing the Walkman. He was told by all his executives that the Walkman would be a costly, disastrous failure. Morita believed that while the Walkman "subtracted value" -- took away features that full-scale recording and playback units had -- it also added value, by making music fully and easily portable. The net balance of the Walkman, Morita thought, was a large value plus. "I do not believe any amount of market research could have told us that the Sony Walkman would be successful," Morita wrote in his autobiography. And it was successful. Sony made more than 70 different models, and sold more than 20 million units. One of the lessons Morita draws from his own experience is the importance to Sony of having its own sales and distribution network, so that "we could get to know [our customers] personally and make them understand the value of our products and the uses to which they could be put." In some ways, knowing costs is easier than knowing values, because costs are objective and data-based, while values are highly subjective and not easy even for consumers themselves to express or define. Both Goizueta and Morita had deep insights into the perceived value of their products, and as a result were able to make courageous, fateful decisions. One way or another, decision makers have to find ways to plug directly into the perceptions and psychology of their customers. Even the most thorough market-research studies do not always achieve this insight, especially when new products are involved that consumers have no real experience with. Harvard Business School Professor Theodore Levitt, an expert in marketing and former editor of the Harvard Business Review, once wrote a famous article titled "Marketing Myopia." In it, he explained why railroad companies and Hollywood film companies shared a common fate -- gallons of red ink and for some, bankruptcy and extinction. What did railroad executives and movie magnates both do wrong? Perhaps, Levitt wrote, they failed to ask themselves a key question, one that can never be asked too often or too fervently: What business am I in? Movies and railroads skidded downhill rapidly, because the managers who ran them failed to ask, and answer correctly, Levitt's question. Hollywood moguls thought they were in the movie business, instead of in the entertainment business. Television, a new form of entertainment -- and later cable TV and videorecorders, nearly buried them, because in the industry of "entertainment value," television proved to be an inexpensive and convenient substitute for movies. Railroad executives assumed complacently that they were in the railroad business. In fact, they were in the business of creating value by transporting people and goods. So were truckers and airlines. Their stiff competition, with some help from public policy, killed the railroads. * What are my customers' needs and how are they changing? * How well does my product meet those needs, compared to its competitors? * What price can my product command for its need-satisfying value? * At what cost can I produce that value? High-value products and services that command premium prices can compensate for excessive costs. But even bare-bones costs will not enable a company to survive, if its products fail to create adequate value for customers in the marketplace. Oscar Wilde once defined a cynic as "someone who knows the price of everything and the value of nothing." Managers are no cynics. They need to know the value of their products, the cost of producing them, and the price those products can command in the marketplace, and to constantly challenge their perceptions by confronting them with new, direct evidence and accurate concise information. Good management is a perpetual juggling act in which cost, price, and value are kept in an appropriate balance, with a sharp eye focused on trends and change that might in the near and distant future alter that balance, for good or for ill.